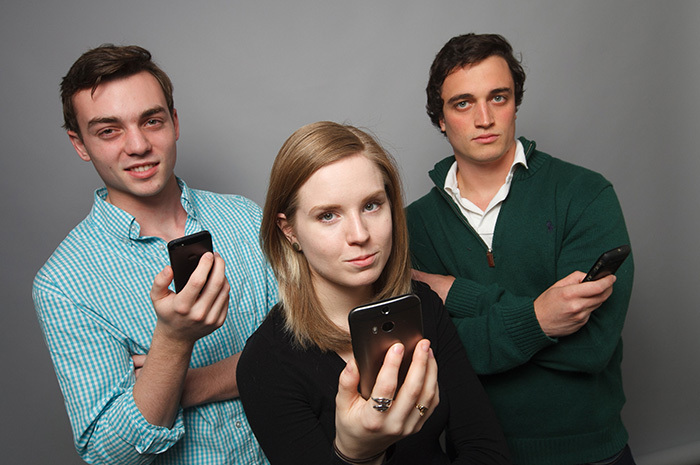 From left: Kevin Henwood '18, Lindsay Kearney '15 and Eddie Finocchiaro '15. Photo by Carl Socolow '77. So you’re driving back to campus after spring break, and you get a text from a friend who doesn’t know you’re en route. You don’t want to text and drive, but you don’t want your friends to think you’re ignoring them. Back on campus, you stop by The Trout Gallery to check out the latest show. You want to learn more about the art, but you’re not sure how—especially since it’s hard to concentrate, given the avalanche of texts you’re fielding from friends in one of your clubs, as they decide on a time for the next meeting. The good news: There’s an app for all of that, or soon will be. Student-entrepreneurs are pairing up with computer-science (CS) majors in Associate Professor of Computer Science Grant Braught’s senior seminar to bring everyday-problem-solving apps to life. While senior computer-science students have taken on many faculty- and administrator-led app projects in the past, this marks the first time that this capstone course has brought three student-led projects to the table, partnering student programmers with their entrepreneurial peers. Henwood’s app streamlines communications among members of a given student club, group or team via a group-messaging platform that also allows users to create, add to and access group to-do lists, votes, photo albums and event planning. Computer-science majors Kevin Rosenberg '15 and Joanne Gilligan '15 built Clubb with Angel Shiwakoti ’17 (computer science, mathematics) and have already rolled out the beta version, as they work out the last minor bugs. Plans are underway for a new Club App feature, Clubb Events, which allows users to not just create group events, but to publish the event via community media outlets. Together, Henwood explains, these tools not only help club members to interact more effectively, but also connect them with interested people outside of the club, such as audience members who might want to view a student performance or volunteers who might pitch in during a community-service event. "Our mission is for Clubb is to create a better, more involved community,” Henwood says. Lindsay Kearney ’15, an art & art history major, partnered with computer-science majors Xin Guan ’15 and Yutong Shang ’16 to build an app for The Trout Gallery—a concept she’d been working on after discussing it last May with Phil Earenfight, associate professor of art & art history and director of The Trout Gallery. Her vision: an interactive, exhibition-specific tool that draws inspiration from old-school gallery audio tours but is reimagined via sleek app technology. It also must be easily updated with each new exhibition. Guan and Shang opted to build on the basics, using a WordPress plugin to convert a WordPress site into an app that includes zoomable images and audio clips that direct the user to important parts of the artwork, as well as external links for further investigation. “It’s like carrying around a museum docent in your pocket,” says Kearney of the app, which is available for download and can be used through Web browsers and Wi-Fi. (While users can skip around to learn more about any artwork in the current show, Kearney recommends going in order so users can see the exhibition as intended, an idea passionately supported by a recent artist-in-residence). The Trout Gallery plans to overhaul the app in advance of each new exhibition and to archive materials from past shows. The Trout Gallery also has purchased a fleet of iPad Minis, which visitors can use while taking in an exhibition. The first incarnation of the app was rolled out in time for the opening of “Bones: Representing the Macabre,” an exhibition Kearney curated as her senior art-history project (on view through April 18). Response has been overwhelmingly positive, Kearney reports. “I took my Modern Art class through the exhibition the morning of the opening, and they all kept commenting, ‘This is so cool!’ ” she says. Like all computer-science seniors, Nicosia and Brown had developed software for laptops and desktops, but this would be their first chance to develop an app from start to finish and their first attempt to apply the Java programming language to the Android platform. The team spent the first month of development learning the Android environment before diving in. According to Finocchiaro, Text n Drive will be ready to roll out in a few weeks. While neither Nicosia nor Brown intend to pursue careers in app development after graduation—Brown will begin working as a cloud-support associate with Amazon Web Services in Herndon, Va., while Nicosia will join RDA Corp. in Hunt Valley, Md., as a software developer—they expect to tap many of the technologies they learned through the project. It’s all excellent practice for the workplace, Braught notes, since those who work in computer science must regularly teach themselves new tools and programming languages on the job. And there are other far-reaching benefits too.